And while the car is referred to as a ‘concept’ Volkswagen prefers to think of it as a “design study” since the vehicle is fully driveable. (With ‘driveable’ being the understatement of the week.) On the outside of the Golf the only thing that would make someone think there’s something unique about the car is the custom body work which not only looks cool but also provides vital air intakes all over the vehicle which feed the impressive engine. 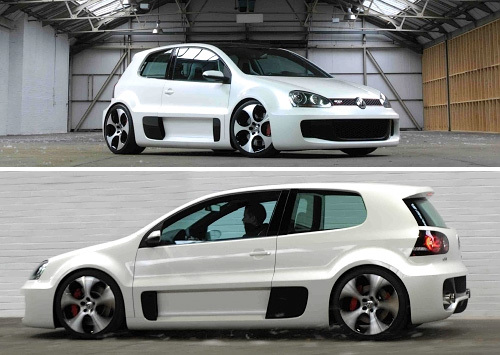 Of course there are probably a few Golf drivers reading this right now who are a little envious of VW’s special toy. But if you’re willing to fork out the whopping €1,000,000 (or about $1,350,000) for the conversion you too can conduct your own “design study.” Otherwise you’ll have to just be content with reading Fifth Gear’s account of the time they spent with the car.